This is the part of a books of the year entry you don’t read because you’re scanning to find the titles this writer has chosen. You haven't noticed his name but you'll check it once your own good judgement has been confirmed. The first is Karl O. Knausgaard’s My Struggle, a popular one this year – you’ve registered the title already because he was chosen in that other list in that other place by that other guy – who was it? Visceral realism blah scandal in Norway blah full of profound insights blah. Oh look, there are the names of Marcel Proust and Thomas Bernhard again, the authors Knausgaard is already being compared to, neither of which you’ve read, though you keep meaning to. It makes you feel alienated and demoralised. Look, there are so many translations and editions of Proust to choose from. What was the title again? And which Thomas Bernhard novel is a good place to start? You see there are still three paragraphs to go and you’re thinking: enough with the summaries already! You relax a little because the next choice is Enrique Vila-Matas’ Dublinesque. The title is so warm and attractive. You see that it’s set around Bloomsday, which is something you’ve wanted to attend for years. Admittedly, you tried and failed to read Ulysses for a university course, but you prefer Radio 4’s dramatisation because it cut through all the verbiage and made the book accessible. Anyway, the novel is about Dublin isn’t it? That should be enough. You had a city break there a few years back and had such a good time in the pubs. Everyone is so friendly! But what’s that he’s saying? It’s about the end of the Gutenberg Era, the end of literature as we know it? What nonsense: has he seen my shelf of Ian Rankin first editions? You skip the third paragraph because he’s chosen Quentin Meillassoux’s The Number and the Siren, a book by a French philosopher about a French poet Stéphane Mallarmé, specifically his poem Un Coup de Dés, which you’ve never heard of let alone read. It’s in French! What if it is a revelation and not what you might expect – a momentous study of the place and meaning of poetry in post-religious society? That’s just pretentious. The final paragraph intrigues you and is the only one that you read in full because it is the shortest and the chooser is obviously passionate about Infinity: The Story of a Moment, Gabriel Josipovici’s novel based on the life of a real composer. That sounds more your kind of thing: you like biographies. "But why call it a novel?" [Naipaul] makes us aware that most writing hurries much too much, and so misses what is essential: that nothing seems to alter, yet everything is in flux. Though this is a book almost without incident it catches unforgettably the transformation of rural England in our time. [...] It is a moving and beautiful piece of work, unlike any other book I know. Last month I considered it for the first time. 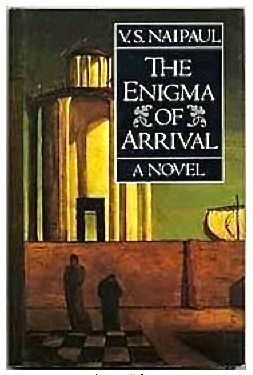 With no patience for any new novel, I reread The Enigma of Arrival and the response was the same, although Naipaul’s delicate self-exposure was far more impressive and moving this time round and darkened by a better appreciation that death is the motif of his story. In 1987 I had followed Naipaul, twenty-five years later I walked beside him. Death is also the motif of Karl Ove Knausgaard’s My Struggle, which I read earlier this year with equivalent pleasure and perhaps the cause of Naipaul's novel floating back into my memory. The title of the British edition – A Death in the Family – makes the motif explicit. Both books are overtly autobiographical and rely on the life of the writer to infuse their narratives with authority, an authority that itself relies on a unique encounter with time, existence and non-existence. This suggests such authority has been depleted, perhaps because fiction relies too heavily on distance. What these books possess in contrast is a pressing proximity. A novel is anchored on generic safe ground even as the writer’s imagination flies high or plumbs the depths, but now that ground is loose and barren. So why is Naipaul’s novel subtitled “A novel in five sections” and the Norwegian and German editions of My Struggle labelled a novel? There are clear differences in each author's approach, suggesting a lack of generic clarity, which is not given to autobiography but is familiar to the novel form. Where Naipaul's focus is on his journey from colonial province to imperial centre in classic bildungsroman fashion, Knausgaard is more concerned with the density of the moment, and where Naipaul is selective and respectful in his exposure of himself and others, never mentioning that his cottage has another occupant, his wife, or that the landlord he refers to throughout is the legendary Stephen Tennant, Knausgaard is famously inclusive. “[He] seems unable to leave anything out,” James Wood complained, quoting a novella-length description of a New Year’s Eve party: “After a few hundred pages of this, I started to grumble: I understood that this was ‘My Struggle,’ but did it also have to be my struggle?” He soon turns around and acknowledges that “the banality is so extreme that it turns into its opposite, and becomes distinctive, curious in its radical transparency”. The need for totality that brings pages about playing the guitar, about drinking tea, about wearing his Doc Martens and listening to his Walkman [...] also brings superb, lingering, celestial passages, like the one in which Knausgaard cannot sleep, and paces his apartment. I kept flicking back to the picture of the greenish clouds, every time it called forth the same emotions in me. It was as if two different forms of reflection rose and fell in my consciousness, one with its thoughts and reasoning, the other with its feelings and impressions, which, even though they were juxtaposed, excluded each other’s insights. It was a fantastic picture, it filled me with all the feelings that fantastic pictures do, but when I had to explain why, what constituted the “fantastic,” I was at a loss to do so. This experience relates back to the beginning of the book in the narrator’s childhood, when watching a news report he sees a face in the sea. He rushes to tell the nearest person, his father, who says: “Don’t give it another thought”. Now you the reader becomes the author’s nearest person and you might respond in the same way as the father or, like me, suffer an intense identification. This latter division is probably key to the original question: why call it a novel? The experience Knausgaard describes is both very personal and fascinatingly impersonal; that is, it draws attention and resists accommodation in narrative whether autobiographical or fictional because it is what is promised by narrative or what underlies it. The lengthy descriptions of the everyday in My Struggle become necessary to frame the urgency of the questions he puts to himself, much as the longueurs of Proust's In Search of Lost Time are necessary to enable the magical phenomena of time's absence. The indulgence and disruption of habit is a constant in both. 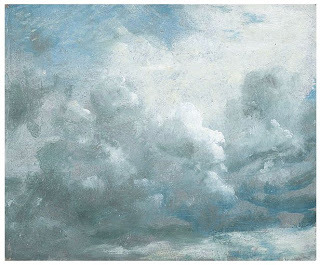 My Struggle rides high on such experiences, of which Constable's cloud study is the incarnation; profound or prosaic yet always promising or threatening a climatic event or revelation. This is why both Knausgaard and Proust differ from generic autobiography and novel: they are witnesses. I felt that in an indirect, poetical way the title referred to something in my own experience. [...] The scene is of desolation and mystery: it speaks of the mystery of arrival. [...] And in the winter gray of the manor grounds in Wiltshire, in those first four days of mist and rain, when so little was clear to me, an idea—floating lightly above the book I was working on—came to me of a story I might one day write about that scene in the Chirico picture. Later he expands on the content of that narrative – a man on a journey to a Mediterranean city in classical times, although he didn’t think of it as an historical story “but more as a free ride of the imagination” – and explains why it never got written. It occurred to him that the story was “an attempt to find a story for, to give coherence to, a dream or nightmare” in which he was living through his own death. This is negative equivalent of Knausgaard's bewildered affirmation before the clouds. A dream is much like a painting in that it consists entirely of resemblance. A self-portrait is the self as experienced in a dream: oneself and another, impossible to reconcile and infinitely beguiling; an eternally evanescent memory. Yet to write out a description of a painting is not only futile but as crushingly dull as telling the story of a dream. It can never be the thing itself, the experience which makes it essential to the self is impossible to convey; “A sponge, suffering because it cannot saturate itself" as Milosz wrote, "a river, suffering because reflections of clouds and trees are not clouds and trees”. Before the second question appears, he compares his poetry to a garish photographic snapshot in contrast to a painter’s eye that “trembles to caress the light”. Something imagined in writing, however, is “paralyzed by fact”. Until I re-read the poem today I had assumed this line was Lowell's decisive call for “life writing”, for attention to be paid to the everyday rather than, as it seems now, a reluctant concession, an admission of defeat. In writing of what happened one must only “Pray for the grace of accuracy / Vermeer gave to the sun’s illumination”. Reading yet again, however, the comparison with the visual arts seems to express less the poet’s anxiety over the superiority of imagination than over writing itself; even if he were to produce the most exquisite work of the imagination, it would be a failure. Indeed, by referring to the “poet’s anxiety” and by reproducing paintings here I confirm this fallen state. Paintings can of course be appreciated by anyone with vision. 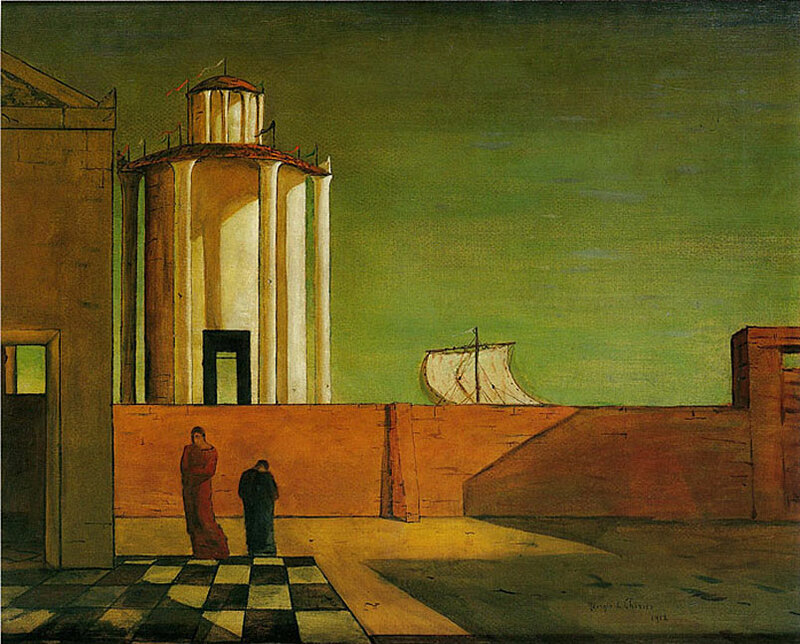 Whether it is a surreal harbour scene or bucolic landscape, each painting is merely there: a unique object in the world. There is no fact or fiction to decipher: a painting merely is. An abstract painting does not provoke impatience in the same way as a so-called experimental novel does precisely because it is before the viewer in the same arena as a classical landscape. The dynamic relationship of the object to what it ostensibly represents or expresses is the encounter we displace only by means of the polite discourse lamented by Knausgaard. What recommends itself then is silence or denial, and the latter does indeed constitute the bulk of literary output: the willed infantilism of popular fiction, the prissy connoisseurship of fine prose in literary fiction, and the po-faced empiricism of reality hunger. Each is after the Lord Mayor’s Show of television, film and print journalism, such that “crime novels can be used to analyse shifts in society” is recommended without irony. Silence has less of a profile of course, but it is present. It’s present in the 800 pages of the two books discussed here. What distinguishes them from other famous novelists’ autobiographical excursions – JM Coetzee’s Scenes from Provincial Life and Thomas Bernhard’s Gathering Evidence being two outstanding examples – is a fascination with moments that resist narrative and a preoccupation with finding a way to make them present in narrative; moments experienced before paintings, in music, in a walkable landscapes and, in Knausgaard's case, even in a TV news report. But not in writing. Writing in fact dilutes these moments – much as a metaphor dilutes – presenting to the writer not only a paradoxical inspiration but a destructive one. The task for the writer then isn’t a matter of genre but of rinsing genre. The common assumption in literary reception is that the novel is the noise of mastery, a story well-told and constructed with craft and good judgement. In public we can affirm this of any given work as we know others will understand as a public does. A recent example is Peter Stothard’s speech recommending a genre novel to win what used to be a literary prize. Except the encounter with a novel, a short story or a poem is not a public experience but one of solitude and silence. Hence the violence of corralling reviews, good and bad, hence the popularity of book clubs, hence the national obsession with prizes. There is a need to mitigate or sublimate seclusion, rarely to explore. What I found that day of blue, empty sky and VS Naipaul’s The Enigma of Arrival and this summer with Karl Ove Knausgaard’s My Struggle were such explorations, attempts to open onto the space that makes narrative possible, the singularities that inscribe themselves on a life and agitate a certain enchantment, opening the past as much as the present and future, yet which cannot be made present to the work itself. For this reason, I would answer both books are more novels than most novels, willing as they are to listen to the silence.